I thought I could count. Really, I did. I mean, my 9-year-old son can do it. I am 29 years old. I even graduated from college. You would think that is enough to be able to master the art of 1, 2, 3. Nope. Not even close. Let me start at the beginning. I was looking around Ravelry one day when I discovered the Lady February Sweater. It is an adaptation of an Elizabeth Zimmerman baby sweater pattern. Currently there are 986 sweaters listed. This tells me that it is a well written and lovely pattern, so I cast on. I had no trouble, 83 stitches cast on the first time. I knit in garter stitch, again easy for an experienced knitter. I worked my increases like marked. Everything was fine, right? Wrong. When it was time to work the pretty lace pattern, I had one less stitch that I need. I am determined to do the pattern right. I go back and find a missed increase about halfway back. Halfway is not all the way, so I ripped it back and started over. I continued all happy-like down to the lace part again. Again, I am one stitch short. Faced with another frogging session, I added a stitch and called it a night. Now, ripping back once would be frustrating enough, but it continues. Once I finished the “easy” garter knitting, I worked the first row of the lace pattern. It is a 7 stitch repeat. This should not be a problem. 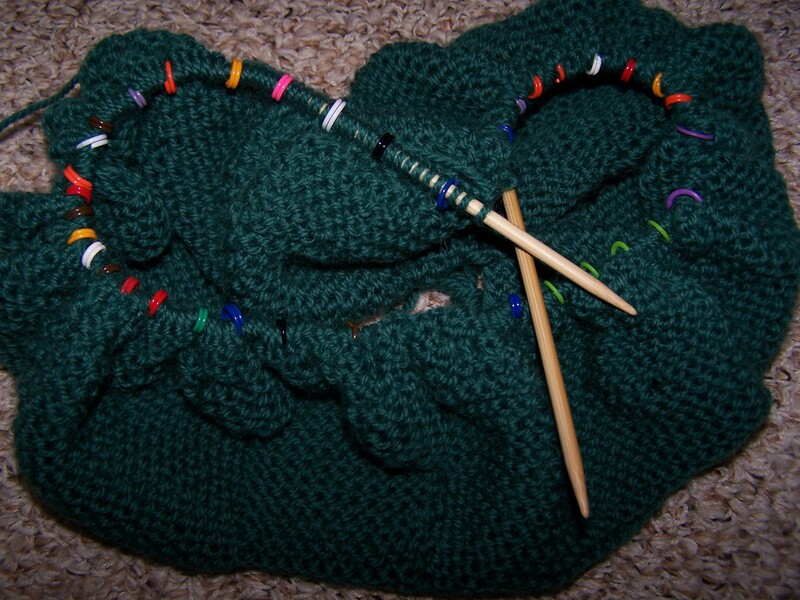 There are 266 stitches with a 7 pattern repeat. That means I will be working the lace pattern 38 times across the sweater. No problem. Except that the 38th repeat only had 6 stitches, not 7. Back off the needles the sweater, all 282 sts, went into a big pile on the floor. I will save you all a longer story by just saying that this happened eight times more for the next two days. Sometimes I was missing 1 stitch, sometimes I was 2 stitches over. Finally I took my own advice which I am constantly telling my son. If you get frustrated by something, take a break and come back to it later. I picked up the Lady last night and started the lace all over again. It is a good thing, too. I was working Row 1, then Row 2, Row 4 and Row 3. No, I did not type that wrong. I was reversing Rows 3 and 4. It is going along swimmingly now. I had to have help, though. Since I obviously can not keep up with 7 stitches at one time and can not seem to read a pattern correctly, I placed markers every 7 stitches to help me keep track of where I am. I did the same thing. Having never made lace I put a stitch marker every 7 stitches. I have done 9 repeats of the lace and got distracted with another sweater. I have to fix one stitch that I flipped on the garter edge 8 rows back and I will be ready for the rest of the 10 or 11 repeats I have left. I just love the Shalom Cardigan from Ravelry and I have really been cranking on it. Hopefully it will be done this week.